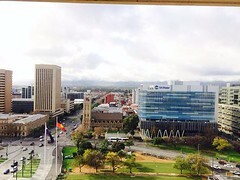 Welcome to Adelaide, the capital city for South Australia! Adelaide is a small quiet city (see Indianapolis), that is known for it’s wine. More on the wine later. We spent a weekend here, although I think if I had one more day I can explore more of the city. The city itself is beautiful and calm, which was quite different from Sydney. The downtown streets of Adelaide was quite empty during the weekend, which is actually normal since most of the people here live in the Suburbs. We were lucky to have good weather while we were in Adelaide (I think the day after we left, there was a snow storm). I think visiting Adelaide is good, but I don’t know if I can live here. There is a reason why i like Hong Kong (the hustle and bustle), so I think the lifestyle here probably doesn’t suit me. Anyways, will be uploading some more posts soon about the stuff we did in Adelaide! Oh, and here’s the view from my room! Gorgeous!